"Death Record - Barbara Eck"
Birth location: Rosheim, Alsace - Lorraine, France. Burial location: [Section: A, Row: 9, Grave: 25] St. Francis Cemetery, Sugar Creek Township, Clinton County, Illinois. 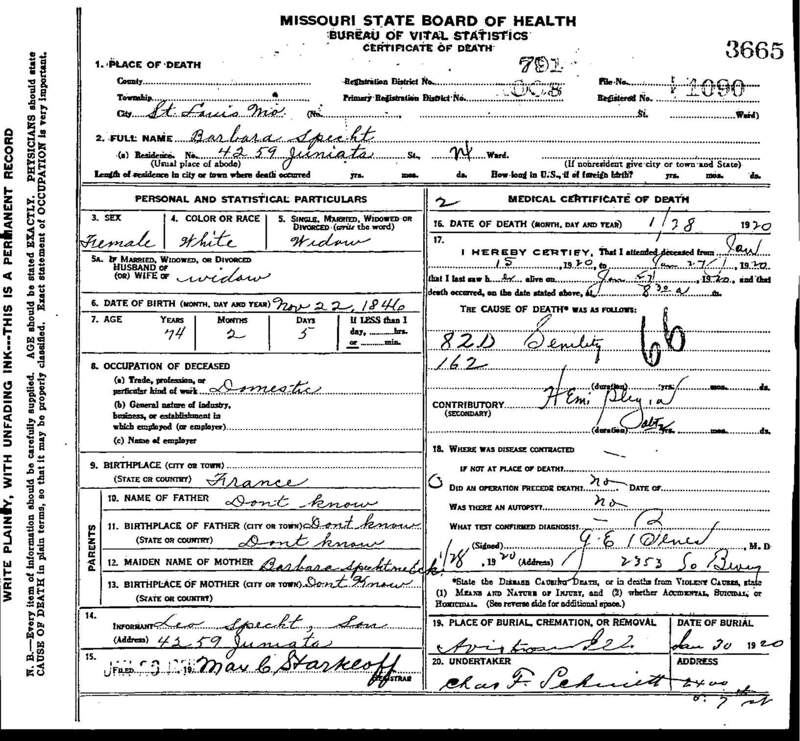 The Missouri State death certificate says, born November 22, 1846, died January 28, 1920. However, the death date of January 27, 1920 is written on the death record at St. Francis of Assisi Catholic Church, Aviston, Clinton County, Illinois. As such, Barbara (Eck) Specht probably died later in the day on January 27, 1920, and the Missouri State death certificate was probably issued the next following day by the undertaker on January 28, 1920. The below death certificate is incorrect in listing her mother as, Barbara Specht ne Eck. The undertaker probably wrote that in place of not knowing the information about her parents. The burial was on January 30, 1920, [Section: A, Row: 9, Grave: 25] St. Francis Cemetery, Sugar Creek Township, Clinton County, Illinois. Tombstone says, "In Memory of. Rest Mother, rest in quiet sleep. While friends in sorrow o'er thee weep."